The new members after being sworn into their new positions. 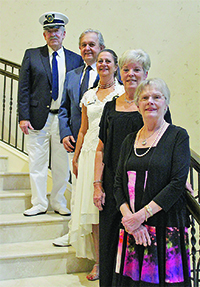 The Marco Island Cruise Club (MICC) celebrated its 40th anniversary recently with a Commodores Ball. The event was held at the Hideaway Beach Club on Marco Island. Members dressed to impress for the symbolical ceremony, which included saying goodbye to the old bridge and welcoming the new. The event also included the time-honored tradition of the Changing of the Watch. The evening commenced with appetizers and drinks. The atmosphere was genial as members enthusiastically greeted one another. Musician Jerry Pellegrino provided the music, playing oldies and other classic tunes. Atop each table was a floral centerpiece meant to mimic a boat, created and donated by the Calusa Garden Club. As the sun set, members settled into their seats for dinner. After everyone was well fed and coffee and desserts had been served, it was time for the Change of Watch Ceremony. The ceremony symbolizes a change of command from one commodore to the next. 2016 Commodore Tom Dines officiated the ritual, relinquishing his title to the 2017 Commodore Lynn Stiles. Photos by Samantha Husted: The new MICC bridge. From top: 2016 Commodore Tom Dines, 2017 Commodore Lynn Stiles, Vice Commodore Carol Bryant, Treasurer Betty Thacher, and Secretary Marlene Marchand. been a wonderful year and as we all can stand and sit we can thank ourselves for good health,” said outgoing Commodore Tom Dines in his opening address. The 2017 bridge was also welcomed to the stage where they were officially sworn into their new positions. 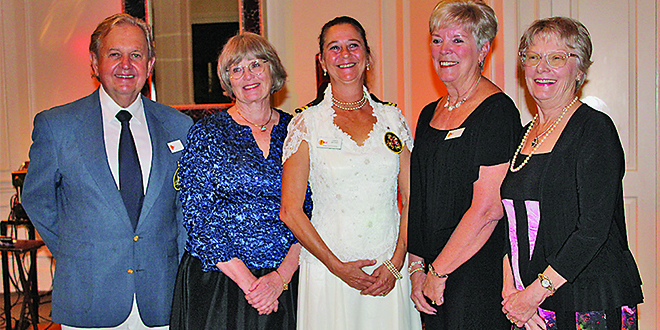 The incoming bridge includes 2017 Commodore Lynn Stiles, Vice Commodore Carol Bryant, Treasurer Betty Thacher, Secretary Marlene Marchand and Rear Commodore Deena Procopio. While the 2016 outgoing bridge included Neil Blaauboer, 2016 Commodore Tom Dines, Vice Commodore Carol Bryant, Treasurer Betty Thacher and Secretary Palma Klein. The ceremony ended in dance. Commodore Lynn Stiles and his wife Vivian danced together before the floor was opened up to the rest of the members. The Marco Island Cruise Club was initiated in 1977, back when Marco Island was barely on the map. Members of the club meet to discuss boat handling, social events and other group activities such as overnight boat trips. The object of the club is to promote sociability, friendship and competent boat handling. For more information check out: www.marcocruiseclub.com.